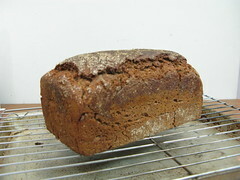 Compared with Kamut Levain and Kamut Bread, I like this one the most. 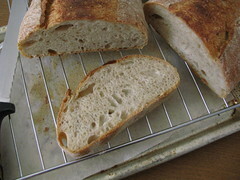 It is in fact Jeffrey Hamelman’s Poolish Ciabatta, but I replaced 30% total flour by kamut (adding to final dough, all poolish was regular flour). I also increased the hydration from 73% to 83%, as water absorption of kamut is higher. 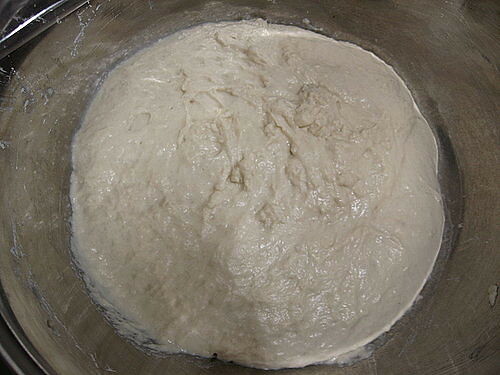 However, apparently 83% hydration was too high and the dough was very slack. Hence instead of folding the dough 2 times (1 time every hour according to original recipe) in the 3-hr bulk fermentation, I folded the dough 4 times in total (1 time every half hour). 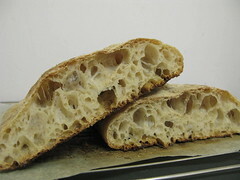 Luckily though the dough was wet and kamut’s gluten is low, the crumb is satisfying with all those big and irregular holes. 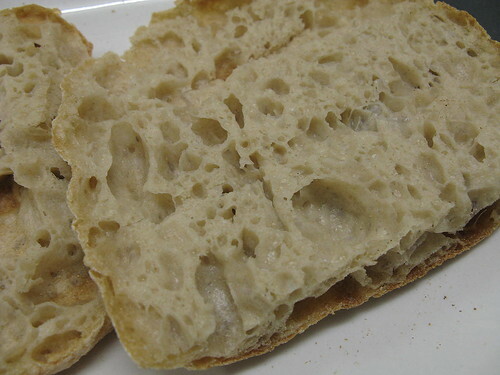 It is less chewy than a regular ciabatta but has a stronger wheat flavor than regular ones. I especially like the mild but unique kamut flavor. Nice. 🙂 The crust is not crispy enough, and I will try to bake the dough longer next time (20mins at 460F this time for 420g dough). 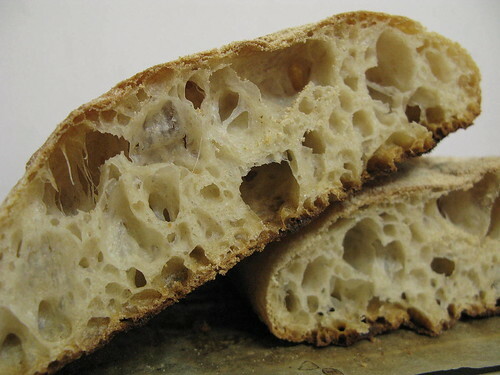 That’s a gorgeous open crumb! 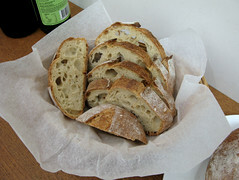 And it does not look too flat for what I typically think of for ciabatta. Thank you. 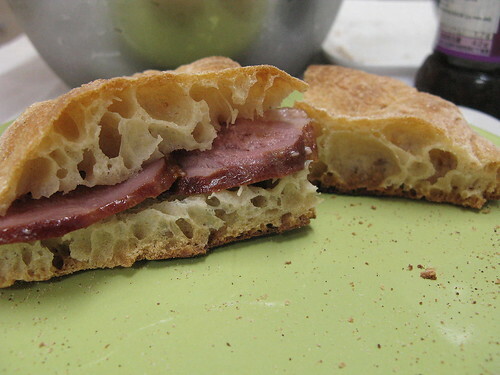 🙂 When I flipped the ciabatta dough over before baking, the two ends were degassed by my hands, so I hope I can do it better. 🙂 Is degassing unavoidable (can only minimize it)? 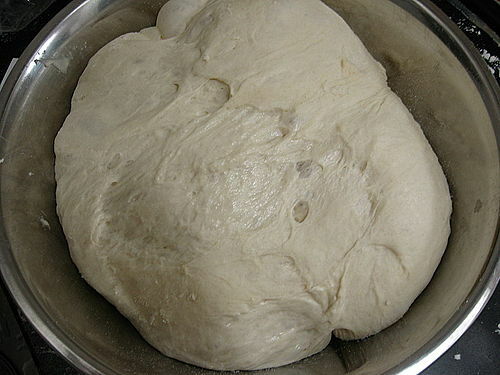 The dough was so fragile! 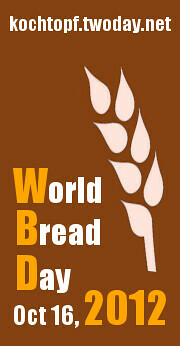 Wow that is some serious crust and crumb action right there. So wide open. Just discovered your nice blog, and I like it. Thanks! 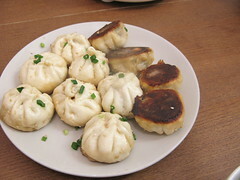 Exactly where did you acquire the points to publish ““Ciabatta with Kamut � Bao/Bread”? Thanks for stepping by but apology I don’t quite understand your question. Do you mean where I published my blog or..? fact a pleasant post, keep it up. makes me think a little bit extra. I personally appreciated every particular element of this post.